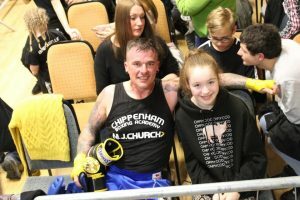 On Saturday 30th March 2019, Stuart Lucas, one of MJ Church’s drivers, took part in a charity boxing event at Chippenham Constitutional Club to raise money for Kitty’s Wish to Walk, a local charity for Kitty-Boo Cox who suffers from cerebral palsy. In February 2015, Kitty-Boo, from Chippenham, had spinal surgery on the nerves in her spine to relieve muscle stiffness caused by her cerebral palsy. Now able to walk on her own for a short length of time unaided, Kitty-Boo undergoes daily physio with her Mum and weekly with medical professionals. The equipment and physiotherapy required costs around £50,000 and is not funded by the NHS. A group of local people, including Stuart, from Chippenham set up a boxing challenge to raise the much-needed funds for the treatment. The evening was very well supported with 350 spectators; boxers were all supported by sponsors, Stuart was supported by the MJ Church Charitable Foundation. Kitty-Boo attended with her Mum and sister; Stuart is a family friend and plans to run the Bath Half Marathon next year to continue his fundraising. Well done to Stuart for competing in this event. Kitty-Boo and her family would like to thank MJ Church for their donation towards Kitty’s Wish to Walk.